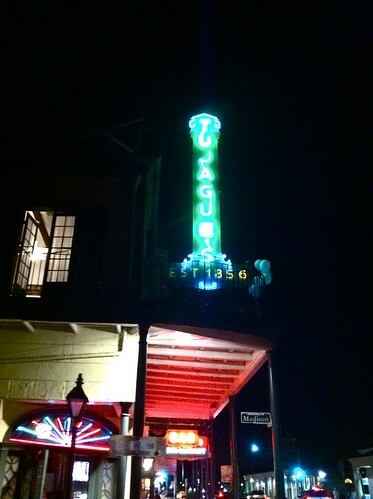 After finally arriving in New Orleans Thursday evening, we went in search of a late dinner to the Roadfood-recommended Tujague's (pronounced Two-jacks), New Orleans' second oldest restaurant. Tujague's offers a five-course meal with a single choice, that of main course. There are four choices given, and chicken bon femme is always available if you know to ask for it. 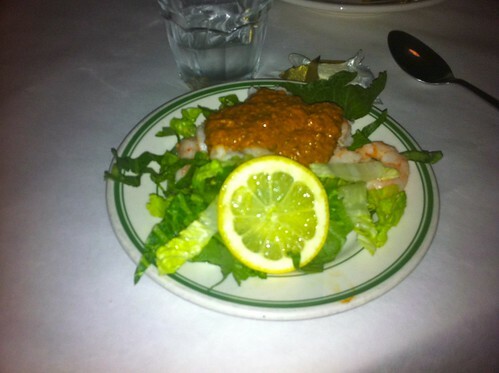 The first course was shrimp remoulade. This is not the mayonnaise-based sauce that I've encountered under the name of remoulade elsewhere; this was a complex, brownish-red mixture of I-don't-know-what. It was spicy enough to be too spicy for Lori; I think I tasted cayenne and mustard in it, but those were only a small fraction of the whole flavor profile. 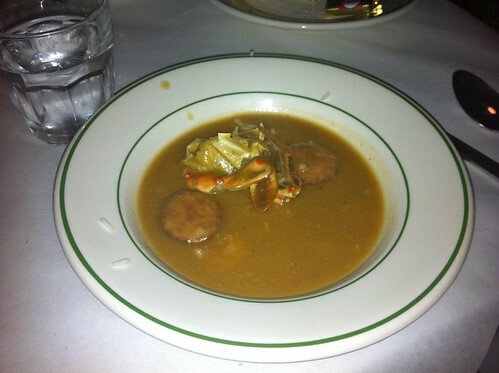 The second course was seafood gumbo. It was a very thin gumbo, unlike most gumbos I've encountered that it wasn't served with rice; it was mostly just broth with a few discs of spicy sausage and a crab body that I didn't extract the meat from. It too was too spicy for Lori, and I wasn't very pleased with it myself. Things improved with the third course, beef brisket with creole sauce. The brisket was splendidly tender, falling into shreds at the touch of a fork. The sauce was much like a cocktail sauce. For the main course, I ordered the chicken bon femme. "Chicken bon femme" translates as "good woman chicken", but what was not clear to me from the reviews I've read was that the good woman has an interest in a garlic farm. It was a layered dish. Layer one on the plate was a layer of salad greens. That was topped with four pieces of fried chicken. 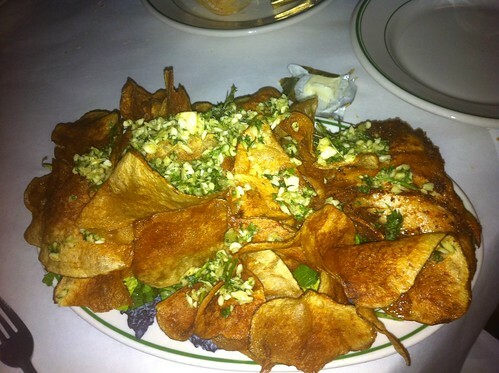 The chicken was almost hidden from view by a layer of housemade potato chips. Then the whole thing was topped with a double handful of chopped raw garlic and parsley - mostly garlic. I've had platters of nachos with less cheese than there was garlic atop these potato chips. I tried to keep the garlic on the chips and chicken as I ate them, but despite my attempts, enough garlic spilled off to pile up in drifts on the table. I was very conscious that Lori and I might be risking an unfortunate garlic imbalance, like the imprudent Stinking Rose incident on our honeymoon. The chips didn't thrill me; they were decent, but a bit too greasy for me to enjoy eating them for long. The fried chicken, however, was excellent: very juicy and flavorful, with an exceptional herby crispy skin. I really enjoyed it a lot. By the end of the course, I could feel the garlic emanating from my whole body. But on the plus side, I felt totally proof against vampires. 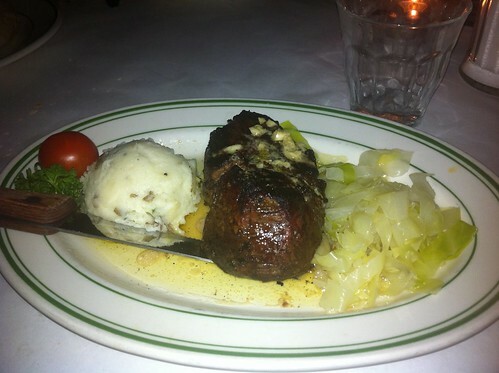 Lori got a filet mignon, served with mashed potatoes and cabbage sauteed with onions. 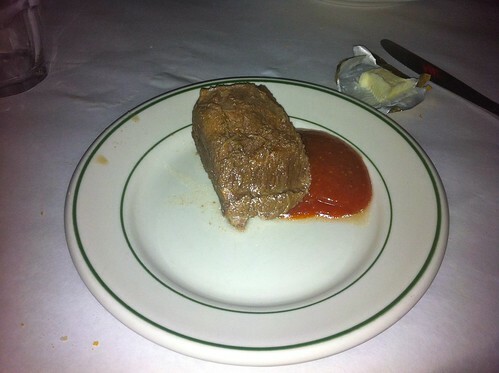 The filet was cooked with a sauce of butter and (cooked) garlic. I was surprised to find that I could clearly taste the garlic in the sauce even though I had eaten so much raw garlic from my plate; it gave me hope that we might avoid garlic imbalance catastrophe. 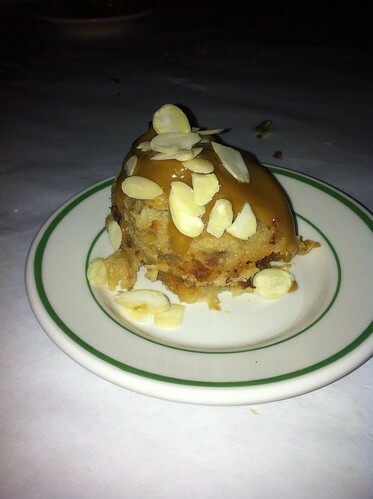 Dessert was banana bread pudding with caramel sauce. It was very good. One last remark about Tujague's: the bar area has a huge mirror, probably 8'x16'. The history of Tujague's we read said that the mirror was brought from a restaurant in France. The thought of transporting such a huge mirror safely with 19th-century technology daunts me.